The Polygraph Confessional | Kalijarvi, Chuzi, Newman & Fitch, P.C. Although the Federal Employee Polygraph Protection Act of 1988, administered by the Department of Labor protects most employees from being required to take a polygraph, federal employees or contractors engaged in national security-related activities may well find themselves required to take and pass a polygraph exam as a condition of being granted access to secure facilities or information. The idea that simultaneously measuring pulse, blood pressure, respiration, and other largely involuntary physiological functions provides an objective indication of the subject’s state of mind including, especially, whether he or she is telling the truth, has been around for more than a century. And, although courts have been reluctant to embrace the technology of the polygraph, the federal government relies on the technology to screen employees and contractors before they are allowed to access sensitive or classified information. 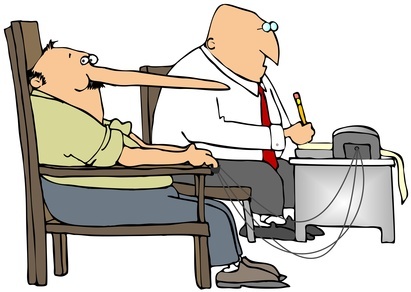 Within the federal government, polygraphs are part of the toolbox of Credibility Assessment (CA), which is described as “the multi-disciplinary field of techniques and procedures that assesses truthfulness and relies on physiological reactions and behavioral measures to test the agreement between an individual’s memories and his or her statements.” This sentiment is also reflected in the Polygraph And Credibility Assessment (PCA) Procedures and the Counterintelligence Polygraph Program. Within the Intelligence Community, the Director of National Intelligence (DNI) is charged with administering the CA program; within DOD, the Under Secretary for Defense (Intelligence) (USD(I)) has primary responsibility for the program, but it is the Director of the Defense Intelligence Agency (DIA) who actually manages the Credibility Assessment program. The National Center for Credibility Assessment (NCCA), located at Fort Jackson, South Carolina, provides training for Credibility Assessment for all federal agencies, as well as research into the effectiveness of various techniques and tools. Polygraph exams may be administered “for personnel security screenings, issue-specific examinations, the adjudication for access to specific types of classified information, and the resolution of other examinee issues.” Most employees encounter the requirement as part of a new job or security clearance application. You fill out the SF-86 and, if it is required for your agency or job, you find yourself scheduled for a polygraph examination. If you, as a federal government employee (whether military or civilian) or contractor, are required to undergo polygraph exam, you should receive notice of the exam and its specific purpose. You will be asked to give consent in writing to being polygraphed. You should be told that you may consult a lawyer before either giving consent or being polygraphed. (But your lawyer cannot attend the polygraph session.) At the polygraph, as with providing information on the SF-86 and throughout the clearance application process, you should be wholly truthful and forthcoming in answering questions. At the same time, you should be careful not to agree to statements that are suggested to you by the polygrapher but are not, to your knowledge, true. Hold firm to what you know. Other than technical questions (such as those used to calibrate the polygraph), you should be asked only questions relevant to the particular focus of the polygraph exam. For personnel security screenings, the questions asked in a polygraph exam must arise out of the Adjudicative Guidelines, ICPG 704.2. You should know that if, during a polygraph exam, you report a possible violation of federal or state criminal laws, the agency is bound to report that information to the Attorney General, the Department of Justice, and to federal investigative agencies (or, in the case of state or local laws, to the relevant law enforcement agency). This holds true for violations of the Uniform Code of Military Justice (which would be reported to the Secretary of Defense and the relevant military criminal investigative unit). Facts that seem to indicate a crime in the planning stages will also be reported. If you refuse to undergo a polygraph exam, or fail to cooperate during a polygraph examination, you are likely to find that your clearance may be denied or revoked. What the IC calls “purposeful non-cooperation” may also result in a negative determination. Under ICPG 704.6(E)(3)(c), “purposeful non-cooperation” includes confirmed use of polygraph countermeasures. This would include the use of drugs, biofeedback training, or behavioral countermeasures to overcome the physical responses measured by a polygraph. Indeed, instances of an employee simply researching such countermeasures on the web in the days before the exam, if admitted, has been used to justify denying a security clearance. Federal employees take – and pass – polygraph exams pretty commonly as part of vetting for security clearances. Before undergoing a polygraph, it is good be familiar with the regulations, what they require of you, and how they protect you, although (as noted above) making yourself too familiar may be disqualifying. If you would like to discuss an upcoming polygraph exam, we would be happy to help.